Future besties: Baby Girl and her cousin. 1.5 months apart, playing at the lake. 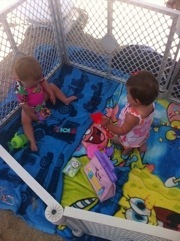 Baby girl’s “cage” as we call it, is necessary in the sand due to the fact that she eats everything she finds. We were lazy campers and left the lake to go out to dinner on Saturday night. 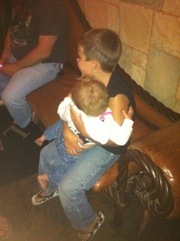 He insisted on holding her while waiting for a table. She is actually awake here, but the flash made her blink. She crawled around and stole all the blankets and settled herself on the pillow all covered up. Baby girl loves cuddly softness. Posted in Infertility, IVF, Miscarriage, Parenting and tagged adoption, family, fun, love. Bookmark the permalink. We Will Swim and Eat and Be Merry! Today was such a fun day! Just me and the two kids went to my dad’s to visit with my brother before he heads home to Utah. We ate some delicious burgers, indulged in “drumstick” ice cream and went swimming. And boy oh boy does baby like the water. yes, I’m talking about THAT same baby! 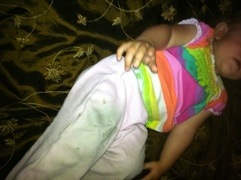 She splashed and kicked and laughed and floated on her back with her head resting on my shoulder. 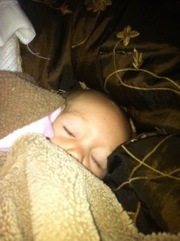 She was so relaxed that she nearly drifted off to sleep! This is baby girl just getting into the splashing and before I ended up getting SOAKING WET and got all the way in! And really, what’s better than a baby in a pink tutu bathing suit? NOTHING, that’s what! I also again, want to thank everyone who has visited me and commented. I love that you all put a smile on my face! Posted in Infertility, IVF, Miscarriage, Parenting and tagged adoption, family, fun, swimming, water. Bookmark the permalink.